There are a few, however, and I’ve sought to detail them a bit here for your dining pleasure and general entertainment. If you know of any others that are worth dropping some Deutschmarks…well, let me know! 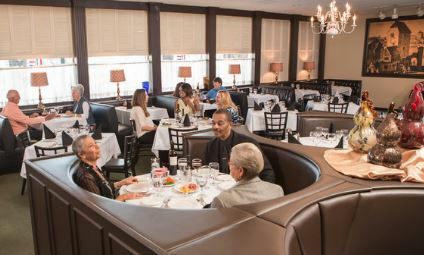 Petite Auberg offers a lovely dining experience, including comfortable booths reminiscent of early ’80s hot tubs. 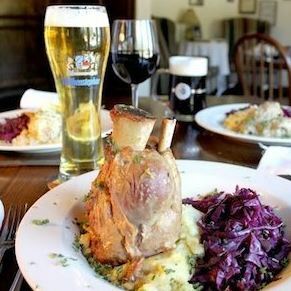 There’s a venerable restaurant in Toco Hills under the name Petite Auberg, which I believe is French for “Just enough German dishes to occasionally bill ourself as a French-German restaurant but not enough to reflect it in our name.” Established in 1974, it’s been an Atlanta fave for four decades and then some. We’re lulled there perhaps every two years, inevitably ordering in a manner that would make my Germanic ancestry proud. This holds true despite the fact that there are more escargot in a serving of their (tasty!) escargot than German dishes on the dinner menu. What it lacks in authentic Deutsch grub it makes up for by its eastside ITP (inside the perimeter) proximity, a well-appointed environment, and warm ambiance. Der Biergarten is true to their name, replete with open-air seating. Garten outside. Bier throughout. There’s another one in downtown that draws a more direct line to the Schwartzwald. Though I’ve only been to Der Biergarten once as part of a massive work/social gathering, I’d wager that the food would be worth the trip. The beer selection truly impressed me, though the snack-type fare we were served wasn’t memorable enough to spark visions of Julie Andrews and the chorus of “Edelweis” when I recall my visit. Though any spot that offers a Konig Ludwig Platter for 6 automatically gets three stars, taste untasted! The Village Corner will help you forget — or perhaps not even care — how ridiculous you look in those Lederhosen. I feel a bit ashamed that I didn’t first and foremost mention The Village Corner, which for all the right reasons secured the URL germanrestaurant.com. It’s fantastisch, charming — hands down it’s my fave, my Lieblingsrestaurant (if that’s indeed a word or a thing … if not, it should be). Rumor has it that I once consumed their Wurst Platte fur zwei. Mind you, sometimes rumors are fact … at least in part. Located near Stone Mountain, which is eastside OTP (outside the perimeter), it’s close enough to Decatur but far enough from the urbanity to make you think for a minute you’re in Bavaria. Zum Bratwurst … or was it Zur? I’d love to say that the little residence turned restaurant on Atlanta’s southside was still in existence. Even before I began the first of four years’ high school German, we frequented the restaurant for special occasions. Throughout 9-12 grades, the German club would visit regularly. What once was a gem of a Deutsch Essen destination in College Park is now a pawn shop.What was the name? I think it was something off-kilter like Zum Bratwurst. That sounds right. Can’t recall for sure, but I have to thank it for fostering a love of German fare and folk and culture and somehow planting the seed for this post some three decades ago. I’ll still raise a glass to it. Prost! Animaniacs. Warum? Ich hab’ uberhaupt keine Ahnung! 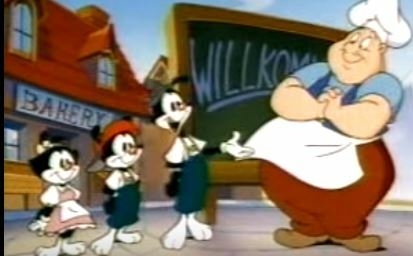 And here, for no good reason that I can think of, is The Animaniacs singing their version of “Schnitzelbank,” featuring Professor Otto von Schnitzelpusskrankengescheitmeyer.